NoBroker is a Bangalore based real estate search portal that connects flat owners and tenants directly with each other. NoBroker is a broker-free property search portal that connects flat owners and tenants directly with each other by eliminating the middleman. The company does not charge any brokerage from either parties. Founded in 2014, the company claims to have 4 lakhs genuine owners and home seekers. It is operational in 5 cities namely, Mumbai, Bangalore, Pune, Chennai and Gurugram. Like the name, NoBroker’s vision is to remove brokers from the scene of real estate. NoBroker was founded by IIT(Bombay) and IIM Ahmedabad graduates, Amit Kumar Agarwal, Akhil Gupta, because they claimed that brokers do not add value in the real estate transaction and still charge heavy brokerage. Akhil Gupta was an application engineer at Oracle and technical lead at PeopleFluent, which provides Software-as-a-Service talent management solutions. Agarwal was an analyst with Cognizant, principal consultant at PwC and associate director at Australia and New Zealand Banking Group. He is also an alumunus of IIT Bombay. The idea came from personal bad experiences with brokers and the unavailability of a working solution. 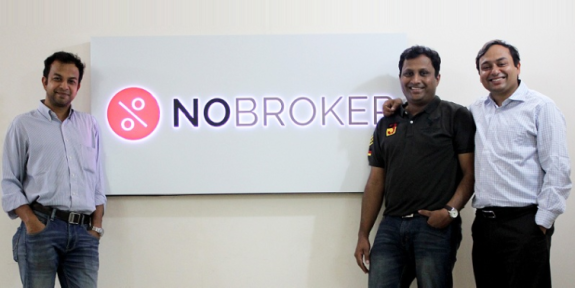 NoBroker was founded because the Co-founders (Agarwal and Akhil Gupta of IIT Bombay) believed that paying hefty brokerage cannot be the only option to finding a new home. The idea of NoBroker was conceptualised in late 2013 and the website was launched in March 2014. The company also introduced a crowdsourcing feature through which users can put up rental listings. In this, anyone can click and upload picture of any TO-LET board with the genuine owner details. Nobroker also pays people if any conversion happens. NoBroker says it has analysed the entire value chain of house hunting and replaced everything that the broker does, with technology, which diffrentiates Nobroker from other online real estate portals. It gives smart recommendations to the customers based on real-time data and assists in making an informed decision. To list a property, the only thing that the user has to do is to give a missed call or leave a WhatsApp message. An executive then calls and helps him/her list the property. Potential tenants can then go through listings assisted by specific search options and then directly contact the landlord to close the deal. One can also make customisable rental agreements on NoBroker. It has gone so far to even remove certain listings that discriminate based on gender or religion. NoBroker has a peer-to-peer site that allows home owners and prospective tenants to connect directly, eliminating the need for a broker. NoBroker offers a subscription model for tenants as well as owners. NoBroker generates revenue in two ways. First by attracting advertisements from furniture start-ups (it claims 2.5 million user visits per month). Second, by offering services such as connecting tenants with movers and packers and drafting rental agreements. NoBroker began monetizing its service using a freemium package, for tenants subscription starts from Rs 999, which provides 25 leads while Rs 1,999 plan comes up with a relationship manager. The company also supplies the necessary legal documents, which are customized for each rental agreement and are sent directly to tenant’s home, even on weekends. It is far more flexible than broker-led agreements which require a tenant to go to the broker’s office during the week. For owners, NoBroker offers a similar plan starting with Rs 2,999. It also has a freemium model with basic features. NoBroker recorded a 465.7% rise in revenue to Rs 6.28 crore in FY17 as compared to Rs 1.11 crore in the previous fiscal. Whereas the company’s losses jumped to Rs 23.59 crore in FY17, a 67.9% from FY16. It had posted a loss of Rs 14.05 crore in the previous fiscal. Employee benefit has accounted for the highest expenditure of Rs 16.19 crore for NoBroker in FY-17. Currently, NoBroker claims to close a few thousand subscribers every month. The major factor for NoBroker’s fast paced growth is its ‘click and earn’ program the company runs to incentivize anyone to add listings to NoBroker. Users that run into a property that is listed offline, simply take a photo of the building and send the details. On receiving the info, NoBroker’s team follows up on the lead and calls the owner. If the property is listed, the user who snapped the first photo is compensated with 100 INR (around $1.50) inside their PayTM wallet. The feature itself is responsible for around one-third of all new listings on NoBroker, a hugely impressive stat. Collectively, No Broker claims it has about 1 million users interacting with the platform on a monthly basis. It also asserts that it’s adding 180K users every month. In the recent funding round, NoBroker raised $10 million (series B) led by japan based BEENEXT venture capital firm and Digital Garage. Singapore-based Qualgro, Asuka Holdings’ Mamoru Taniya and existing investor SAIF Partners. Also participated in the round. Prior to that, NoBroker had raised $3 million in Series A from SAIF Partners along with Fulcrum Ventures in December 2014. It has also been angel funded by Saurabh Garg (Co-founder of Four Fountains De-Stress Spa) who also acts as a mentor for NoBroker. NoBroker is up against some formidable rivals in the property space in India. Japanese telecom firm and high-spending investor SoftBank backed Housing.com, and PropTiger which has grabbed money from News Corp. The other competitors also include Quikr, Magicbricks and 99Acres. NoBroker plans to expand out in India ASAP, but it also has its eyes on overseas markets. That’s where it believes its new investor base can pay dividends.